1. Solar Screens do not make you home darker, now you can leave your blinds open all day instead of closed like they are now, actually the net effect is more sun light into your home. 2. Solar Screens provide a third layer of insulation for double pane windows making them 15% more energy efficient in winter time. 3. Solar Screens DO NOT void the window warranty for the majority of window manufacturers. 4. Solar Screens can be taken off and removed in the winter to allow solar heat gain for passive heating of the home and cleaning of the window. 5. Solar Screens block on average 90% of the heat entering the home, that is not an "up to" number, that is the average with the sun at all angles, with a high angle in the southern sky the blockage is almost 100%!! 6. Solar Screens provide daytime privacy, blinds can be left open and nobody can see into your home. 7. 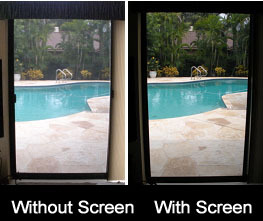 Solar Screens stops 90% of the UV Rays from entering your home which can cause fading of valuable furnishings. 8. Solar Screens blocks 90% of the visible light heat which is responsible for 44% of the heat gain into a home. 9. Solar Screens provide exterior sun shading to stop the heat before it enters the home, like having a shade tree in front of every window in your home. 10. Sun's energy is absorbed by the open weave design of the fabric and then dissipated through the holes in the mesh as air moves through it.